Fans of UST and FEU also cheered on the NU Lady Bulldogs on Sunday. Arvin Lim, ABS-CBN Sports. 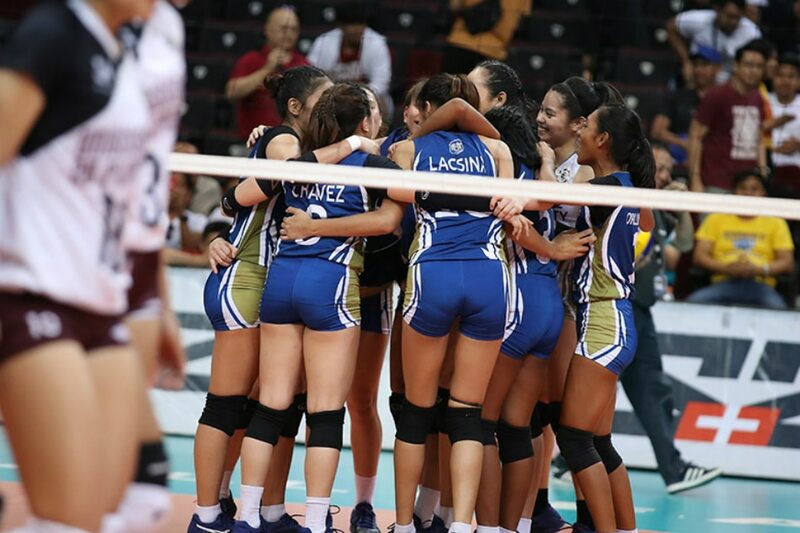 MANILA – National University received support from some unlikely sources on Sunday, when they were taking on the University of the Philippines in the UAAP Season 81 women’s volleyball tournament at the Mall of Asia Arena. For the Lady Bulldogs, it was a no-bearing game. At 3-9, they were already out of the Final 4 race, and simply wanted to end their campaign on a good note. For the Lady Maroons, however, it was a must-win contest, as they entered the match with their Final 4 hopes hanging by a thread. That thread was snapped by National U in sensational fashion. The Lady Bulldogs built a two-set lead, lost it, then outlasted UP in a marathon fifth set to claim a 25-21, 26-24, 17-25, 23-25, 17-15 triumph. And as the match reached its closing stretch, the Lady Bulldogs were bolstered not just by their own fans, but also the supporters of Far Eastern University and University of Santo Tomas. UST and FEU were set to play in a crucial game of their own on Sunday, but a loss by the Lady Maroons would send both teams to the Final 4. Thus, it was no surprise to see the fans of both schools cheer their hearts out for the Lady Bulldogs; the UST and FEU galleries erupted in celebration when Audrey Paran scored the match-winner that sealed UP’s fate. “Na-shock nga kami na may nag-cheer sa amin (from UST and FEU),” admitted Paran, who finished with 15 points in the upset win. Paran was used to seeing their own schoolmates cheer for them, but the sight of fans in FEU’s green and gold, and in UST’s black and yellow, yell out NU’s fight songs came as a surprise. “Parang nakaka-shock lang na nagchi-cheer ‘yung ibang schools for us,” she explained, also noting that they were unaware of the implications of their win in the Final 4 picture. Libero Jennifer Nierva, who had 30 digs and 27 receptions in a superb performance, said the support from the other schools’ fans gave them a boost of energy — especially in the final stretch of a match that had lasted two hours and 25 minutes. “So parang sabi ko talaga noong last game, amin ‘to,” she added. The cheers from the UST and FEU fans, combined with the support from their own crowd, helped the Lady Bulldogs combat not just the Lady Maroons, but the UP crowd as well. In the end, however, it was also NU’s desire to win and show their character that got them the victory, said Nierva.